I had dined at L’Arpège a couple of years prior and had a wonderful experience, so I knew I wanted to return on my most recent trip to Paris. I had a bit of trouble making the reservation myself, so I got one of my credit card concierges to make the reservation for me. Once again, I decided to eat there at lunch, as it’s significantly more affordable than dinner (although the dinner menu is also available at lunch). I ended up going for the lunch surprise menu, which was 145 euro. I said that I didn’t eat meat, which the person who took my order confirmed, but I later realized that not eating meat doesn’t mean quite the same thing in French as it does in English. Up first was an egg course. Last time, I had l’oeuf parfait, or the perfect egg. This time, the egg was good–an egg yolk served with maple syrup and sherry vinegar foam–but it wasn’t as rich as other egg dishes I’ve had. The yolk itself was rich and delicious, but I felt like the accompaniments didn’t bring enough to the table. You can also see butter in the background of this picture. The bread and butter service at L’Arpège is absolutely incredible–best I’ve ever had. I think I ate two wedges of butter and eight slices of bread throughout my meal. A tomato gazpacho with celery and mustard ice cream followed. A fun play on acidity and temperature. This course was refreshing and light. Up next was beet sushi with fig. Sushi is often about the rice, but I did not think the sushi rice was very good, and I’ve had much better vegetarian sushi. There was a bit of a smoky flavor, but the plate was overall a bit too sweet with the beet, fig, and surrounding caramel sauce. The following course was simple, but one of my favorites. Melon with buffalo mozzarella and olive oil. It was creamy, salty, sweet, with the perfect balance of flavors and textures. The olive oil was perfectly salted; the melon was perfectly sweet; the mozzarella was perfectly creamy. This dish was so, so good. Next was vegetable ravioli, which is a “classic” dish as this restaurant (as is an egg dish). I wasn’t a huge fan of this dish the last time I was at L’Arpège, and I wasn’t a huge fan this time around either. The soup was very acidic, the ravioli interiors were very herbal and crunchy, and the pasta was overdone. My first clue that my statement “I don’t eat meat” was lost in translation was when the next course came. It was described as a lunchtime surprise, as sea urchin had just come into season. Now, I love sea urchin, so I wasn’t about to send it back, but it seemed odd to serve seafood to someone who said he doesn’t eat meat (of course, in French, not eating meat means not eating land animals, rather than being vegetarian and not eating seafood either). The sea urchin was served with scallops and an apple, carrot, and cucumber emulsion. The following course was a sweet onion gratin with parmesan cheese and caviar tomatoes. This was so sinfully rich and delicious. Incredible sweetness from the onions, richness and umami from the parmesan, and great acid from the tomatoes and greens. This was like the best grilled you’ve ever had, but multiply that experience ten times to get this dish. I forgot to take a picture of the next dish, but it was a fricassee of green beans with pear and juice of sage. It was like an extremely elevated green bean casserole. Absolutely delicious, and the pear was a great addition. The next dish certainly surprised me. It was a filet of dover solefish, potatoes, mussels, leeks, fennel, and cabbage. First, it was seafood, and second, it was an absolutely enormous portion. It’s not really realistic to serve such large portions in a tasting menu. Not all tables received this dish–for example, the table next to me got a lobster preparation that was similar instead. An umami bomb was served next. A ball of vegetables composed of peppers, tomatoes, hazelnuts, beets, and other things, accompanied by a tomato sauce. Beet root tartare followed, which was really good. The “tartare” was creamy and sweet, the tomatoes provided some nice acid, and the “egg” on top was actually a tomato sitting on cream. Super playful take on steak tartare (and the plate is gorgeous). The final savory dish was a sweet potato lasagna. Hazelnuts on top, sweet onions and parmesan inside, with a super acidic foam surrounding. This was good, but super rich, and a bit challenging to eat after 11 other courses and way too much bread and butter. Dessert number one was a hazelnut Paris Brest. The choux pastry was actually a bit salty, which made the dessert all the more delicious. This was such an incredible pastry. At this point, I was also given a plate of mignardises. Often, I find that this is one of the weakest parts of the meal, but I greatly enjoyed most of these. The only one that I found a bit strange was that one of the cookies had cream and bell pepper in it. The second dessert was a pear and raspberry sorbet served tableside. So soft and creamy and deliciously tart. The final dessert was a chestnut and caramel napoleon. I had specifically requested the millefeuille for dessert since I had missed out the last time I dined here, so I was super happy to receive this dessert. There was a bit of tartness from apples inside, and the pastry was so ridiculously rich and flaky. So much sugar and butter. Overall, the meal was 145 euro for the lunch menu, and 9 euro for a bottle of San Pellegrino. Was it as good as I remembered? Not quite, but I’ve also eaten quite a bit more since that first meal. I still think it’s a great value at lunch, and it’s definitely a restaurant to visit if you like vegetables (although if you’re vegetarian, you need to explicitly specify no meat and no seafood!). This entry was posted in Dining, Travel, Trip Reports and tagged dining review, l'arpege, michelin star, paris, travel, trip report on December 12, 2016 by Edward. Tian in Vienna is one of only three Michelin-starred restaurants in the world that I’m aware of that doesn’t serve meat. Joia in Milan is another. I went to Tian for lunch and had a great, affordable vegan meal. I loved the interior of the restaurant. Super airy with high ceilings. It felt interesting and bright. For lunch that day, they offered the choice of 2 or 3 (or more) courses from the light lunch menu, or you could order a 4-, 6-, or 8-course tasting menu. I asked for 3 vegan courses from the light lunch menu (although no vegan dessert option was listed, they substituted a vegan dessert course for me). The amuse bouche was a mushroom foam. It was tasty and savory like any good mushroom foam should be, although it was quite salty. The bread service consisted of a delicious house-made ciabatta served with three kinds of olive oil, an extremely rich butter that was almost cheesy, and some sprouts. I’ve never been served sprouts with my bread, but I enjoyed it. It was fun and unusual. As a starter, I received turnips and cabbage. I felt that my dish was a bit confusing, but it was decent. My dining partner had the asparagus as a starter. I felt that the preparation of asparagus at Tian was better than the asparagus dish I had eaten at Steirereck the day before. My main consisted of sunchokes and spelt. It was a hearty dish and a large portion, although perhaps a little one-note. It could have benefited from some acidity or freshness. My dining partner had the risotto, which was an absolutely massive portion. For dessert, I received a plate of chocolate and passionfruit. I loved the presentation, and it was extremely tasty. The brightness and acidity of the passionfruit was a nice contrast to the sinful decadence of the chocolate. My dining partner had a sour cream strudel, which she also greatly enjoyed. Overall, the lunch menu was extremely affordable, and I thought the food was quite solid. The three-course lunch menu was only 34 euro, and I’d love to return for the full tasting menu at some point. 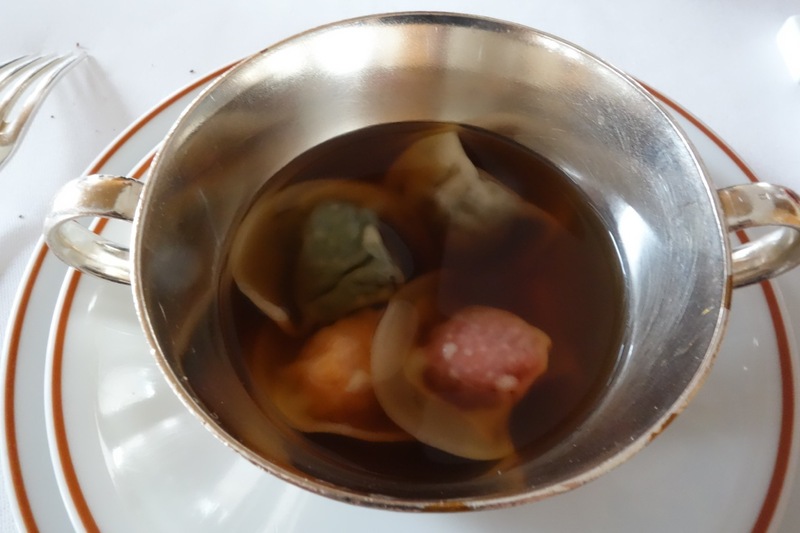 This entry was posted in Dining, Travel, Trip Reports and tagged dining, michelin star, travel, trip report, vienna on September 26, 2016 by Edward. One restaurant that I dined at in Vienna was Steirereck, a two Michelin star restaurant. I went for lunch, which was more affordable experience than dinner. Steirereck is located in a somewhat funky reflective building in Stadtpark. The park itself is also quite nice, if you get a chance to walk around. We were the first guests to arrive for the lunch service. The decor inside was understated and elegant. There are a couple of separate dining areas, so it feels like a more intimate dining experience since you don’t see all of the diners in the entire restaurant. I went for the four-course lunch menu, as I chose to skip the cheese course. We started with selections from the bread cart. I sampled the black pudding and blood sausage bread as well as the rye bread with honey and lavender. One small downside (or upside depending on your perspective) was that we got the end pieces of the loaves since we were the first table served for lunch. The breads themselves were delicious and served with three sticks of butter with different toppings. Not pictured here were the amuse bouches that we were served. My first course was the char with beeswax, yellow carrot, “pollen”, and sour cream, one of the signature dishes of the restaurant. It’s a slightly gimmicky dish in that they come out with the char and pour the beeswax in front of you (and then take it away so it cooks), but the char was cooked perfectly and it was absolutely delicious. The caviar served on the side was great, as was the jelly infused with beeswax. A super inventive and wonderful dish. My next course was green asparagus with sheep’s cheese, daylilies, and bergamot. To me, this was the biggest miss of the meal. I was hoping for a treatment of vegetables like you might find at L’arpege or Manresa, but this was just not that great. My main course was the charcoal grilled tubers with tumeric “caviar” and shoots. This was a giant portion and generally tasty, but it wasn’t that remarkable otherwise. My dining companion ordered the cheese course, and out came an enormous cheese cart. There are so, so many choices in front of you. I’m not a big cheese person, but it might be worth it to order the cheese course just for this experience. The dessert courses were great and satisfying. My dining companion had an absolutely delectable souffle; I had a wonderful preserved calamansi (a citrus fruit) with cream cheese, gingerbread, and walnuts. Interesting flavors, good contrasting textures, and not too sweet. Everything I want in dessert. Finally, there were some petit fours from the kitchen. They were cute, if a little simple. Overall, it was an enjoyable dining experience. The char was by far the best dish of the meal, but otherwise, I wouldn’t go out of my way to recommend this restaurant. This entry was posted in Dining, Travel and tagged dining, michelin star, travel, vienna on September 12, 2016 by Edward. Joia in Milan is one of the very few vegetarian restaurants in the world that has a Michelin star. There are, of course, many Michelin-starred restaurants that serve vegetarian food, but I’m talking about restaurants that serve no meat. So when I found myself in Milan recently, I knew that I had to eat at this restaurant. I made a reservation for 7:30pm, which is late for me to eat dinner, but this is Italy, so I was the only one in the restaurant for about half an hour when I arrived. Joia offers three different tasting menus, as well as ordering a la carte. I decided to go for the most extensive tasting menu which was named “Zenith”. I also asked for everything to be made vegan (rather than just vegetarian), and they were happy to oblige. The first thing brought to me looked like a painter’s palette. It had a number of raw vegetables served with various things to dip them into. This was a bit playful and whimsical, but wasn’t much more than dipping raw vegetables into vinegar and oils. The first cooked course was a fake cactus served with parboiled potatoes in a creamy, tart, acidic goodness. There was also a carrot at the bottom of the pot, which was a nice crunchy and sweet surprise. This offered up a good potato flavor and was again quite playful. The first dish that was on the written menu was called travel notes. The cup contained almond milk foam, celeriac, artichokes, and olives. On the spoons were passionfruit and 25-year old aged balsamic vinegar. This course had a deep, meaty flavor (strange to say meaty when there’s no meat), and the flavor notes reminded me a lot of Chinese food until I got to the olives and balsamic vinegar. The bread was served in a bamboo steamer, and one of the breads also reminded me a lot of mantou, which is a Chinese roll. The next official course was the shape of life. This was a fake egg made out of beets and filled with almonds and other things. This was an incredible course, both in taste and execution. I’ve never eaten anything quite like it. Up next was a vegan take on foie gras. I have no idea how they made this because it really did taste like foie gras. It was super savory and accompanied by apple, a crazy delicious tofu that was more like a savory mochi, and a kale chip. This was course was another winner. The next course was a truffled cream with artichokes and cabbage. You were meant to take the herbs on the side and rub them in your hands to release the aromas (but not eat them). This was crazy delicious, although maybe a tad salty. The charred cabbage leaf on the bottom of the dish was some of the best cabbage I’ve ever had. The soup course was a curry that contained more delicious cabbage. The soup and its contents provided a nice mixture of textures. I am generally not a big fan of soup courses, but I thought that this was a great soup. Next was a miso cream on top of a rice cake with artichoke inside. The rice cake was executed perfectly with a slightly crispy outside but chewy inside. The miso cream was quite pungent, but it was worked well with the rice. The next course was my least favorite of the night. This was a replacement course because I requested a vegan tasting menu, but it was a clear artichoke soup with a buckwheat disc, balls of carrot and turnip, different purees, and some balsamic vinegar. This course didn’t make much sense to me and was unwieldy to eat with just a spoon. I was then brought a nut ravioli with carrot puree, a tart sauce, and carrot, celery, and avocado. The ravioli and puree were really good, but I didn’t really understand why they needed the other things on the plate. Up next was a pea cake, tofu, mushrooms, and grapes. It was served table side from a cauldron, and the sauce was incredibly meaty and heavy. I did not realize that you could get these sorts of flavors only using vegetables. The next course consisted of fried artichokes on top of cabbage. The cabbage was again delicious, but I think the batter of the artichoke was missing some salt. The final savory course was similar to a cheese course with an almond cheese served with turnip, brussels sprout, and beet. This was a great course that was simultaneously simple in composition but complex in flavor. The first dessert course had green tea cream, anise almond milk ice cream, orange, and hidden pomegranates. I’ll admit that this dessert was a little strange, as I didn’t think that the flavors melded that well. Citrus fruits the Asian way contained orange, grapefruit, kumquat, and a tangerine sorbet. It was also served with a stick of incense for additional aroma. I feel like the most Asian part of this dish was the kumquat, but I’m not complaining because it was a tasty dessert. The penultimate dessert was called “gong”. And it was served with an actual gong. When they serve you the dessert, they put a mini gong on your table and ring the gong before you eat. Part of the rationale is that the chef wants to make sure to involve all of your senses in the dining experience (hence the things like the incense stick and rubbing herbs with your hands). The actual dessert was an almond milk foam and cream served with raspberry and chocolate. Absolutely delicious. The final dessert was a raw chocolate and coconut mousse served with raspberry, mango, and guava. You really can’t go wrong. The service throughout the meal was very attentive. Everyone was on the ball, and my water glass never went empty (surprisingly hard for me since I drink a lot of water!). The service maybe wasn’t as formal as restaurants with more Michelin stars, but there were no miscues and the service was generally very competent. This meal ended up taking about 2.5 hours and cost 110 euro (+3 euros per bottle of sparkling water). I think that this was extremely reasonable given the inventiveness and playfulness of the food, but I recognize that not everyone will be as amused as I was, and not everyone is looking for novelty in their food. But I heartily recommend this restaurant for any vegetarians or vegans looking for a fine dining experience or for those people who are looking for novelty and whimsy in their food. This entry was posted in Dining, Travel and tagged dining, joia, michelin star, milan, travel on March 20, 2016 by Edward. Fontainebleau is a relatively small town outside of Paris. Some tourists take the shortish (~40 minute) train ride out to Fontainebleau to visit the famous chateau in this city. 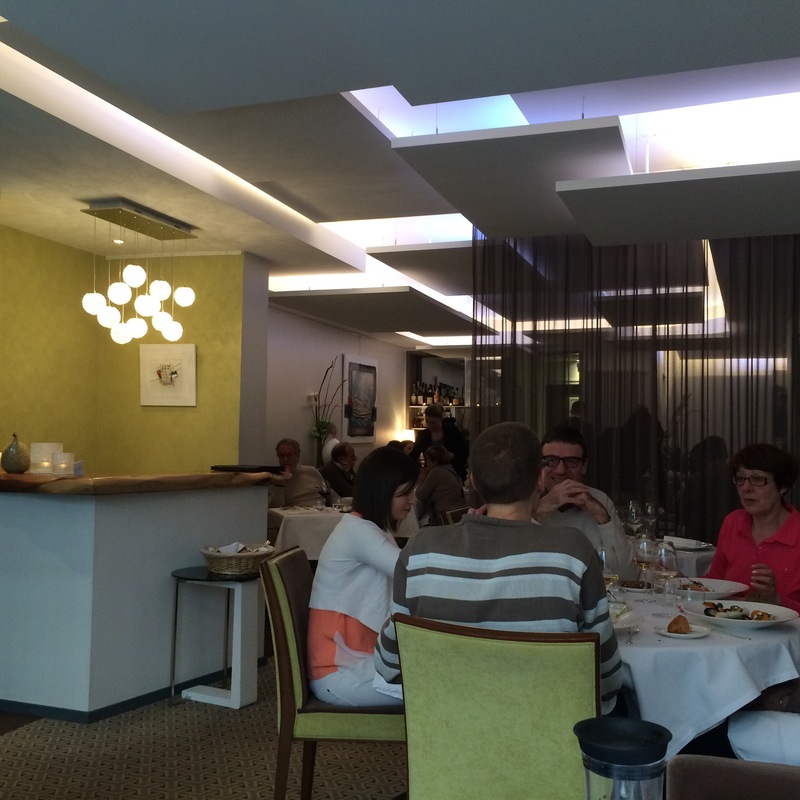 When I visited Fontainebleau, I decided to dine at L’axel for lunch, which has one Michelin star. Because I wasn’t sure about my schedule, I just walked into the restaurant without a reservation, but I walked in pretty late in the afternoon, and it was not the busy tourist season. For lunch, they offer their full tasting menu, a shorter menu, and a lunch menu. I decided to go with the menu gastronome, which is their medium-length menu at lunch (this seemed to be the most common choice at lunch the day I was there). Up first was a couple of small bites: a beet and mussel tart, a kabocha squash puree, and a spoon with smoked salmon. Each of these bites was fine, but nothing special. The best smoked salmon I’ve ever had (and one of the most perfect bites of food I’ve ever had) was at Willows Inn on Lummi Island (Washington state). The bread service was solid. I love me a good bread service (why don’t more airlines have better bread?). The butter could have been served closer to room temperature, but I loved that they provided salt with the butter since salt is key to unlocking the amazingness that is butter. The amuse bouche was a foie gras flan with herring eggs and a smoky foam. This was pretty delicious. I’ll mention that one of the servers was quite good and spoke very good English (those are two separate facts). The rest of the wait staff defaulted to French, which I mostly understand, but it’s not a restaurant where all of the wait staff are comfortable conversing in English. My first course was described as a daikon millefeuille with crab salad. There were a lot of things on this plate, and while everything tasted good, the components didn’t feel additive to me. My main course was sesame-crusted duck, served with sweet potatoes, beets, bok choy, and a raspberry vinaigrette. This was a pretty heavy and sweet dish (the sweetness coming from the sweet potatoes, beets, and vinaigrette). I’d imagine that most other people would like this dish, but it wasn’t my favorite. The final savory course was a take on a cheese course. 1000-day old gouda served on top of a salad. I’m generally not a cheese person, but this was absolutely delicious. The first dessert was a vanilla wanna cotta with jellied apples, a poppy flower mousse, and… pop rocks. Okay, they might not have been actual pop rocks, but they were some sort of carbonated candy that made the same mouth sensation. I’ve encountered pop rocks in dessert a number of times now in fine dining restaurants, and while it’s fun, it feels a bit gimmicky to me. Dessert #2 had a lot going on, but it was tasty. There’s apple, orange salad, avocado mousse, green tea, pastry cream, sorbet, praline, and pastry here. Finally, there were some petit fours to end the meal. Overall, the meal took about two hours, and I thought that the pacing was good. For 52 euro, I felt that this was a pretty good deal for this quality of food and service, especially given the current exchange rate. I wouldn’t hesitate to go back if I found myself in Fontainebleau again. This entry was posted in Dining, Travel and tagged dining, france, michelin star, travel on March 14, 2016 by Edward. Eating out in Helsinki is generally expensive, and I hate spending money on mediocre food, so I figured that I might as well just splurge a little bit and get significantly nicer food. One of my new year’s resolutions was to eat 12 new Michelin stars this year, and Helsinki features 5 starred restaurants, so I was in luck. I ended up walking in to Luomo around 9:30pm, as I had passed out for a couple of hours after checking into my hotel and didn’t wake up until 9pm. I first tried to get a table at Olo, but they were full for the night (and completely booked about 3 weeks out when I started thinking about reservations). Luomo is located only a block away, and both are located right next to the market square. The actual restaurant is located on the second floor of a building, so you need to walk up some stairs in a sterile hallway, but the restaurant itself features a minimalist decor. You can order 3, 5, or 7 courses from the menu. 3 courses gets you one appetizer, one entree, and one dessert, while 5 courses gets you all three appetizers, one entree, and one dessert. I opted for all 7 courses, and it looked like all the tables around me did the same. To start, I received 4 amuse bouches that were different plays on things found in the market square located nearby. First was a meat pie ice cream served with ketchup, then a cup of “coffee” made out of black olive puree, next a spoon of yogurt with leek made to look like bird poop, and finally a taste of herring and fennel. This was both the best and worst dish of the night: while I loved the playfulness and fanciful nature of these bites, none was actually very tasty. The first official course was a medley of different mushrooms and preparations. It was rich, earthy, and flavorful, with contrasting textures from the various kinds of mushrooms and thick foam that made the “porridge”. It was served with a brioche studded with mushrooms. This course was crazy delicious, and one of my favorite dishes of the nice. As an aside, the butter was well salted and served at room temperature and thus easily spreadable, two things that I always appreciate. The next course was a lobster tartare served with pieces of lobster and various purees. To me, this dish was good, but a couple of the purees were a little too acrid and pungent, so the balance was off. The third course and final appetizer (although all appetizers were pretty large portions) was duck marinated in anise served with pumpkin. I think it was supposed to be a soup, but it was a little confusing because they didn’t pour very much liquid into my bowl, and the liquid that they did pour wasn’t hot. I’m not sure if the temperature was intentional, but the pumpkin/licorice/duck combo worked well together. This course was accompanied by a sage roll. The first entree of smoked whitefish was served with a little bit of showmanship. The course was brought covered by a glass shell to hold in the smoke, and then the shell was removed to uncover the fish and release the smoke. While the dish was competently executed and cooked well, the fish was not particularly memorable except for the presentation. Next up was an intermezzo of dried apple, apple jelly, and apple ice. For the second main course, I had lamb served with artichoke puree, cous cous, citron, and a rosemary focaccia. At this point, I was quite full of savory foods as the portions were much larger than I expected, so I couldn’t finish the plate, but I again couldn’t find fault with the execution of the lamb although it was not particularly memorable. Before dessert came a pre-dessert of sweetgrass panna cotta with dried berry powders. This was one of my favorite things of the night as there was a great contrast between the delicate flavor of the panna cotta and the bold tartness of the dried berries. This dish also felt extremely Nordic and local, which I enjoyed. Dessert #1 was a deconstructed carrot cake of carrot puree, carrot foam, marinated carrots, carrot cake crumble, cream cheese foam, and cream cheese ice cream. This was fun, playful, and had a nice carrot flavor, but there were probably 2 too many components on the plate. The second dessert was a chocolate cake with a molten chocolate chai ganache on the inside, chocolate sauce, chai ice cream, and chai crumbles. The balance of textures was great, with the cake, the liquid filling, the ice cream, and the chai crumbles which had a chew to them. This dish wasn’t overly chocolatey but still incredibly rich and decadent. Overall, I was pleasantly surprised by this meal and thoroughly enjoyed it. The service was competent (although sometimes hard to understand, particularly near the ends of descriptions of dishes when they would just seem to sort of trail off and their accents would seem to get thicker), and the pacing was deliberate (my meal took about 2.5 hours). The food was extremely well executed, with a couple of memorable dishes, and the food was a good combination of Nordic cuisine with a touch of molecular gastronomy. At 85 euro for 7 courses, I also think that this is a relatively good deal for this kind and quality of food (also considering the relative expensiveness of Finland and that 85 euro is inclusive of tax and gratuity). This entry was posted in Dining, Travel and tagged dining, helsinki, michelin star, travel on December 4, 2013 by Edward. L’Arpège is mecca for vegetarians. It’s the only 3 Michelin star restaurant that I know of where the primary focus of the food is on vegetables. Chef Alain Passard decided to showcase vegetables in 2001, several years after he had already received a vaulted third Michelin star, and it’s a testament to his craft that he retained all three stars after making the switch. L’Arpège is also reputed to have the best butter in the world, with Bordier making a butter specifically for Chef Passard. Given all of the above, and the fact that several chefs that I adore said that L’Arpège was on their must-eat lists, I knew that I had to eat there when I visited Paris. I made reservations well in advance using the Visa Signature Concierge, but for lunch service instead of dinner service, as the lunch menu is considerably less expensive than the dinner menu. While lunch was still a very pricey 140 euro per person, the dinner menu clocked in at 420 euro, which I believe is the most expensive menu in Paris. Compare to a 420 euro truffle menu! Granted, truffles are expensive. Before getting into the food, I have to say that the service was impeccable. I loved the hostess in particular, who was personable in both English and French. When my dining partner had a hard time choosing between “scales” or “feathers” for his meat course, she exclaimed, “why not have both!”, and we had an extra course compliments of the house. Chef Passard also comes around during the meal service to talk to every table. While he does seem to prefer diners who speak French, he’s friendly to all, and it’s a nice gesture for him to make an effort to chat with everyone. Trio of tartelettes as an amuse bouche. Bonus: they gave us two plates! Possibly because we devoured the first plate so quickly. Beurre Bordier. Best butter in the world? We went through two of these slices. Described as the perfect egg. I think that’s a fair description. While I’ve had great imitations at other restaurants, the egg at L’Arpège is a must. Onion gratin with SO MUCH BLACK TRUFFLE. I’ve never had so much truffle in my life. It’s a very different flavor than what I thought truffles tasted like. See this NYTimes article for more information about truffle oil. This is one of two courses which I didn’t “get”. It’s a beet. A rather large one at that. While it was subtle and pure, I wish this course would have been smaller. Celeriac pasta. Better than any actual pasta that I’ve had. The other course that wasn’t my favorite, but that’s largely because I’m not a cheese person. In spite of consuming no meat, this was the most gluttonous food experience of my life. To give you a sense of perspective, we were seated at 12:30pm, and we finished 4.5 hours later where we had to waddle out of the restaurant. Chef Passard had warned us to save room for dessert when he came to chat with us, but I didn’t expect to receive three! (For what it’s worth, it seemed like the desserts were distributed somewhat arbitrarily: some tables received a millefeuille, which I really wanted and will be sure to request next time; some received ice cream; all seemed to receive at least two different things) When the apple tart was set on our table, my dining companion and I burst out laughing because it was all too much. L’Arpège was a superlative dining experience. I will surely return whenever I’m in Paris. Although the price tag is high, I firmly believe that it was actually quite inexpensive for what you receive. The Michelin guide describes three-star restaurants as having “exceptional cuisine, worth a special journey”, and I have to agree that L’Arpège is worth a special journey, especially if you have any vegetarian tendencies. This entry was posted in Dining and tagged dining, michelin star, paris on July 5, 2013 by Edward.